Timocco turns Therapy Into Fun! Timocco is an online, therapeutic gaming environment specifically designed for children with special needs. 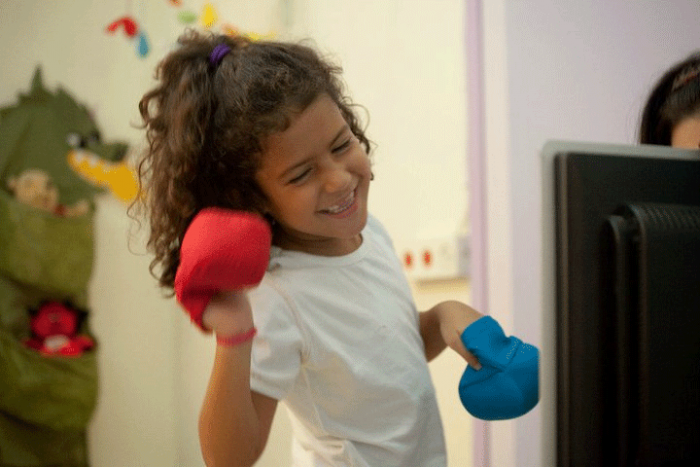 Using motion based technology, our games respond to the child’s movements. Timocco’s patented tracking software allows any webcam to identify and follow player’s movements by following objects held by the player. Timocco’s mission is to provide motivating and meaningful games that are therapy orientated, thus encouraging the child to participate and progress to the best of their ability. Timocco’s broad range of games have been especially designed by Occupational Therapists to provide interactive and motivating opportunities for developing motor, cognitive and communication abilities. Results from each game are recorded to allow for easy tracking of progress. Providing the motivation kids need to keep developing their motor, cognitive, and communication skills. Which therapeutic population can benefit from Timocco? Timocco addresses functional and skill based goals that are relevant for a range of different therapeutic populations: Cerebral Palsy, Autism, ADHD, Learning Disabilities, Developmental Coordination Disorder, and Early Learning. What You Need to Play Timocco. Once you’ve joined Timocco, downloaded our tracking app and you’re ready to play, all you need is a webcam and two round differently-colored objects – either red, blue, or green. Apples! Red or green apples work great with Timocco. Colored container lids (like m and m tube caps, Coke bottle caps, Play-Doh lids, etc). Got the idea? There are lots of objects that will work. Even with lots of options, it's easy to find the right games, fast. Filter games by age and skill and adjust individual game settings to fit therapy goals today and in the future. Our powerful patented motion tracking technology enables you to use almost any red, green or blue round object to play Timocco games – fruits, veggies, pegs, play-doh or any other household item! Timocco’s gaming system works off your computer and uses a patented motion-tracking technology to bring you an affordable addition or supplement to a clinical therapy program. 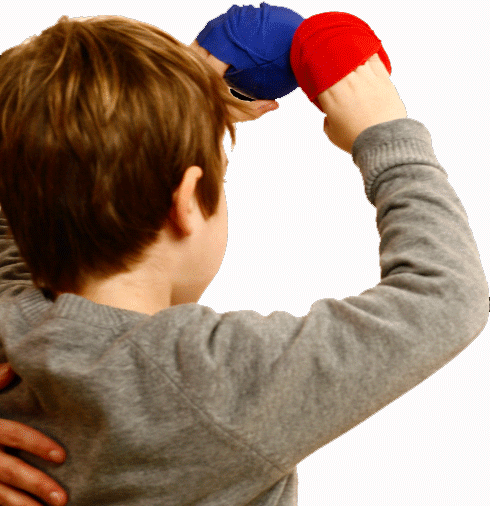 Timocco’s gaming balls can be slipped onto a child’s hands like a mitten for a sensory experience or to help kids who have difficulty holding the ball. The gaming balls also have a strap you can use to attach the ball to other extremities (i.e. legs) for additional workout options. With our internet-based software use Timocco Online anywhere with internet access. While kids work with the tool in-clinic or at home, therapists get to track, study and record their progress through Timocco’s tracking module. 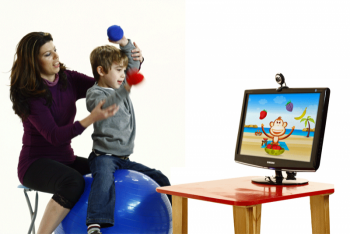 From extremely active kids to wheelchair bound kids, Timocco enables you to calibrate games to fit your child's skill and motion capabilities. Kids can even play Timocco with just their eyes, using eye-gaze software! One of my young cliets is very hyperactive and I could not get hime to settle down for therapy. I set hime upon Timmocco and he never left his air while playing! I just have to say I LOVE TIMMOCCO. I have a student in high school who has significat hemiparesis of the right arem. The student ofern lets their arm hang at their side. I had the student on the Butterfly game annd they were flesing their shoulder above 90 degrees, activity engaged and excited to be playing the game. The student also then gave a high-5 at above 90-degree range! I am an occupational therapist working in a public school setting; primarily with students diagnoosed with autism. Most of my students demonstrate fine motor/visual motor and bilateral coordination skill deficits. They also struggle with auditory processing for successful participation. Timocco programming gives me a fun way to successfully zone in on needed motor/coordination skill building and pratice! Timocco has been an excellend addition to my lessons; as well as increasing the students' fine motor skills and awareness of cause and effect, it's fun and engaging activity that they can really enjoy. Tomer's progres - from complete inability to participate in spacial activities to active participation for a length of time - was astonising. Not only was he willing to participate in activities, at the beginnig of a session he expliticy askes to play by saying: " Monkey, monkey". Ben was highly motivated to play the gaes and as a result, he used his weaker hand constantly and for longer periods of time. He played, succeeded, had fun and most of all, worked on strenghening his upper extremities and lernined to believe in his abilities. Within a few months Hen-lee demonstrated improvement in her upper extremity movements and visual performance. She initiates more movements with her right hand and is successful in games that require visual discrimination."